When connecting with people online and when you game, it may be difficult to manage all fronts at once. Sometimes, it would be easier to have a keyboard that understands and allows you to connect with mobile devices, perhaps to answer IMs or handle Discord chats. The Roccat Skeltr has you covered. This is a smart communication gaming keyboard that not only is designed to help with gaming, but with keeping in touch. The Roccat Skeltr has so many ways to connect. It starts with a dock for the device built into the keyboard. You can press a button to answer calls and have them go through your headset. There is a button that lets you switch between typing on the computer and your device. There is even a companion app that works with your phone and the PC, so you can use your mobile device to control it. Everything works together with the Roccat Skeltr. When people have wireless mice, there is always a concern that lag and latency issues will sometimes impair the gaming experience. After all, they don’t have the same stable connection as a wired mouse. But Roccat has that covered. It offers the Leadr, a wireless gaming mouse that uses an Owl-Eye optical sensor designed specifically for wireless use without compromising. The Leadr has no power-saving modes, because it is always optimized. That means 2.4GHz data transmission and 1000Hz polling, to eliminate any kind of lag and ensure its aim is true. It has a 20-hour battery, but when that runs low someone can simply pop it in a dock and keep on moving. And it is ready for any possible gaming activity, thanks to its 14 buttons and 2D Titan Wheel. Use the Swarm software to set it up and customize it for your needs, then enjoy the freedom it provides. 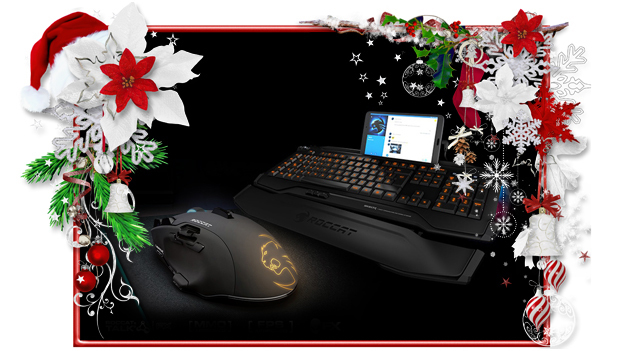 For more product details on the Roccat Skeltr Smart Keyboard & Leadr Mouse, click here!